You can drop off a passenger at the Departures level at both domestic terminals. To help keep this zone congestion free and ensure other passengers get to their flights on time, we ask that you stop for no more than one minute. Due to security restrictions, you are not permitted to leave your vehicle and these areas must be only used to drop off passengers. If you're dropping off a disabled passenger, there are clearly signed designated areas available to you in the passenger drop off zones. The driver must remain with the vehicle at all times. If your passenger needs assistance accessing the terminal, we recommend an additional person attends to assist while the driver remains with the car. To reduce congestion and ensure that other passengers get to their flights on time, we ask that you stop for no more than five minutes in these areas. Directions for arriving passengers: Follow the green signage and lighting from Arrivals. There’s a handy passenger waiting area with a range of refreshments available for purchase. Directions for drivers: Follow the green signage for Priority Pick-up as you arrive in the Domestic precinct. Note that all parking payments are made automatically via e-TAG charged as you exit the zone. No cash or credit card payments are accepted at Priority Pick-up. If you don’t have an e-TAG yet, you’ll be directed to alternative parking. These rates are charged automatically via your existing e-TAG when exiting the zone. Directions for arriving passengers: Follow the yellow signage and lighting. Directions for drivers: Look out for the yellow signage for Express pick-up, which directs you into the right-hand lane as you enter the Domestic precinct. 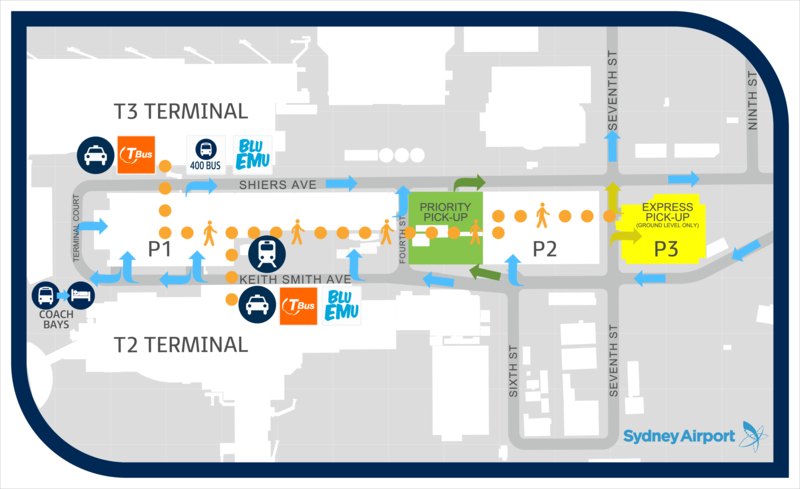 Directions for arriving passengers: Find the complimentary Blu Emu bus stops outside the Domestic terminals. The shuttle leaves every 10-15 minutes. Allow plenty of travel time during peak traffic times. Accessible pick-up spaces are available kerbside on the Arrivals level outside T2 and T3. There are 2 kerbside spaces at each terminal. Driver must remain with their vehicle at all times.